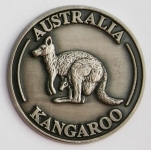 AUSTRALIA coin Red Kangaroo and Joey is 30.5mm in diameter x 2mm thick and single sided. Colour is antique silver. The woodturner or woodworker can insert our coin into a variety of wood working products, e.g. penny paper weights, bottle stoppers, bowls, cutting boards, key rings, etc. Give the tourists what they want; a piece of Australian timber with an Australian icon.